Chronic pancreatitis is inflammation of the pancreas that does not heal or improve—it gets worse over time and leads to permanent damage. 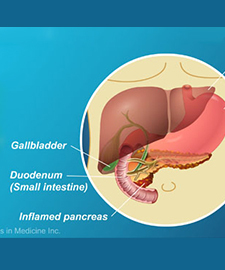 Chronic pancreatitis eventually impairs a patient’s ability to digest food and make pancreatic hormones. Industrialized countries have estimated an annual incidence rate of 5-12/100,000 people who will develop chronic pancreatitis. The prevalence of chronic pancreatitis is 50/100,000 people. Chronic pancreatitis often develops in patients between the ages of 30 and 40, and is more common in men than women.